Says people of Green Bay want access to affordable healthcare, public schools fully funded, and our roads fixed. Governor Tony Evers on track. MADISON – State Representative Staush Gruszynski (D-Green Bay) offered the following remarks after attending Governor Tony Evers’ first State of the State Address at the State Capitol on Tuesday evening. 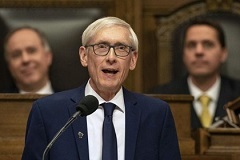 “Governor Tony Evers’ State of the State Address shows that the Governor has a clear agenda that sets politics aside to put the people of Wisconsin first. Like the Governor, I am ready to work with my colleagues in the legislature to move Wisconsin forward, which is exactly what my constituents asked me to do. The people of Green Bay want access to affordable healthcare, they want to see our public schools fully funded, and they want us to fix our roads. So does Governor Evers, and so do I,” Gruszynski said. Gruszynski was elected to represent the 90th Assembly District in November 2018 and serves on the following Assembly committees: the Committee on Forestry, Parks and Outdoor Recreation, the Committee on Local Government, the Committee on Sporting Heritage, the Committee on Tourism, and the Committee on Rural Development.